HAVE YOU BEEN INJURED IN A WELDING ACCIDENT? Welding is an extremely hazardous activity which accounts for thousands of severe injuries and deaths each year in the construction industry. The risk of a fatal injury from a welding accident is more than four out of every thousand construction workers over a worker’s lifetime. The United States Department of Labor’s Occupational Health & Safety Administration (OSHA) has established a variety of regulations to try and reduce the number of workers killed and severely injured in welding accidents. Unfortunately, despite the efforts of OSHA, many owners and construction companies fail to follow the safety regulations established by OSHA. Despite the strict guidelines set by OSHA and the New York State Department of Labor, each year workers suffer serious injuries in welding accidents, including third degree burns, loss of vision, loss of limbs and death. Determining whether you are able to bring a claim for a welding accident requires a thorough understanding of the various laws of New York and New Jersey, in particular the Labor Law of New York §240(1), §241(6) and §200. 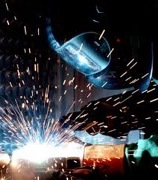 The NYC welding accident lawyers at Gair, Gair, Conason, Rubinowitz, Bloom, Hershenhorn, Steigman & Mackauf have vast knowledge in these areas of law. DO I HAVE A WELDING ACCIDENT LAWSUIT? If you or a loved one has been seriously injured or killed as a result of a welding accident, it is critical to speak with an attorney who has a firm grasp of the various construction and labor laws. The New York welding accident attorneys at Gair, Gair, Conason, Rubinowitz, Bloom, Hershenhorn, Steigman & Mackauf have an abundance of experience in representing injured construction workers. Please contact us today.